Note: Not all food is featured in this list, but most of it has been included. 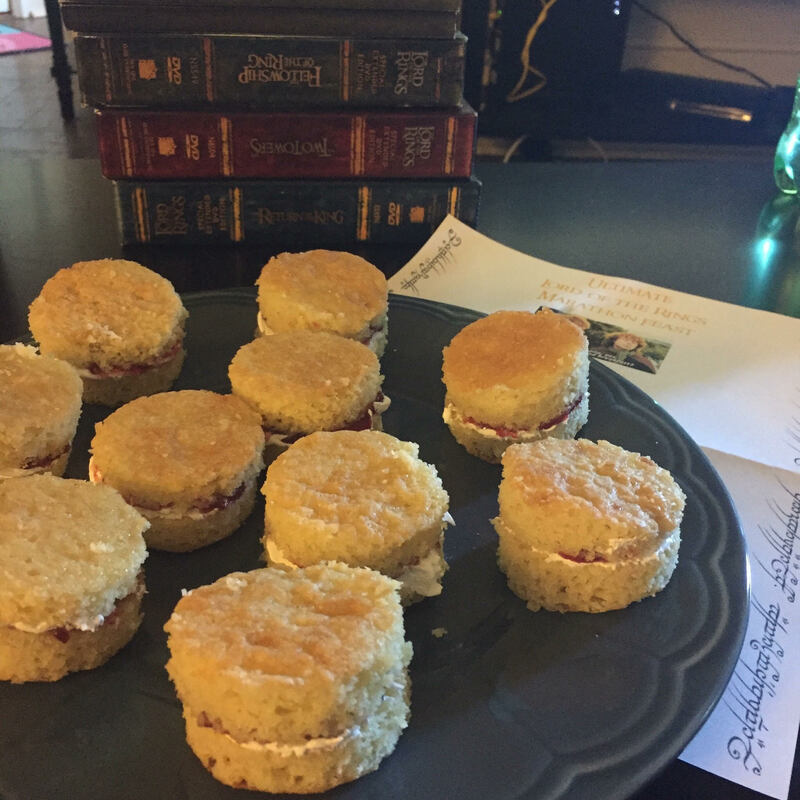 Our Victoria Sponge Cakes, which were a bright start to a day full of food in Middle Earth. 1. The movie starts off with cake, jam, and tea for breakfast. We chose to make Victoria Sponge Cakes, which have jam in them, to start off our day. To match the berry jam, we made ourselves cups of berry tea. 2. When Gandalf and Frodo meet about the One Ring, there is jam, bread, and tea on the table. We decided to make some Lemon Raspberry Tarts to cover the first two ingredients, and finished off our tea from the first meal. 3. Pippin and Merry are stealing raw vegetables from Farmer Maggot. Time to munch on some raw carrots! 4. Aragorn throws an apple to Pippin when he inquires about Second Breakfast, so we all ate a fresh Gala apple. 5. The hobbits’ hunger leads to poor decision making as they cook up bacon and mushrooms on Weathertop, alerting the Nazgûl to their location. Bad for the hobbits, but a delicious meal for us. 6. The Fellowship stops for food at the Gap of Rohan, where they eat sausages. More delicious breakfast food! 7. Lembas bread in Lothlorien! We found a recipe for homemade Lembas bread, and just like Sam and Frodo, we got quite sick of eating it by the end of our marathon. While I only mention it here, make sure to keep lots of Lembas bread on hand for the plethora of times it gets eaten in the series. Our “Orc Power Juice,” also known as strawberry pomegranate sangria. 8. After some Lembas bread to start us off, the Orcs give Pippin and Merry what we dubbed “Orc Power Juice” to keep them going. For our marathon, this meant sangria, but you could also substitute grape juice, cranberry juice, or another dark reddish liquid! 9. Our star Uruk-hai proudly declares that meat is back on the menu. While the orcs cannibalize a slain orc, we decided to instead just have some barbecue pork ribs. 10. Gimli munches on some cheeses when the group arrives at Rohan, so we made ourselves a nice cheese plate. 11. Gollum finds a rabbit, which Sam adds to a stew with potatoes (boil ’em, mash ’em, stick ’em in a stew). We couldn’t get our hands on a rabbit, so we just settled for stew with potatoes. 12. Immediately after the rabbit stew, Eowyn makes Aragorn some gross fish stew. Not wanting another full meal or unappetizing food, we all decided to take one bite each of clam chowder. 13. Faramir takes Sam and Frodo to see Gollum hiding out by a waterfall, eating a raw fish. We enjoyed some fresh sashimi to avoid having to feast Gollum style. Denethor has great taste in food, he’s just not very good at eating it. 14. After a largely foodless end to The Two Towers, we kicked off our third and final feast with some more sashimi as Gollum munches on yet another fish, washing it down with the Lembas bread Frodo and Sam are running out of. 15. Pippin and Merry find Isengard’s store room filled with preserves, and the salted pork is particularly good. We had some pork and beans so that we could include preserves in the mix. 16. Hail the victorious dead! 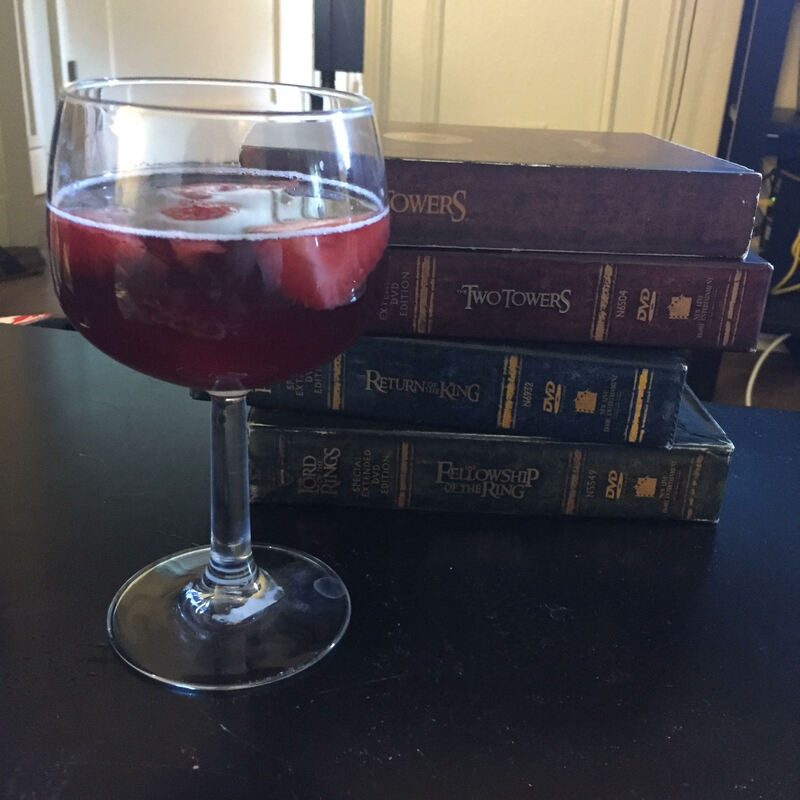 We toasted the fallen warriors with the leftover sangria from our Orc Power Juice, but what really matters is that you toast, not what you are drinking. 17. Denethor once again beats out Gollum for the title of “Grossest Eater” with his meal of chicken, grapes, bread, and tomatoes. 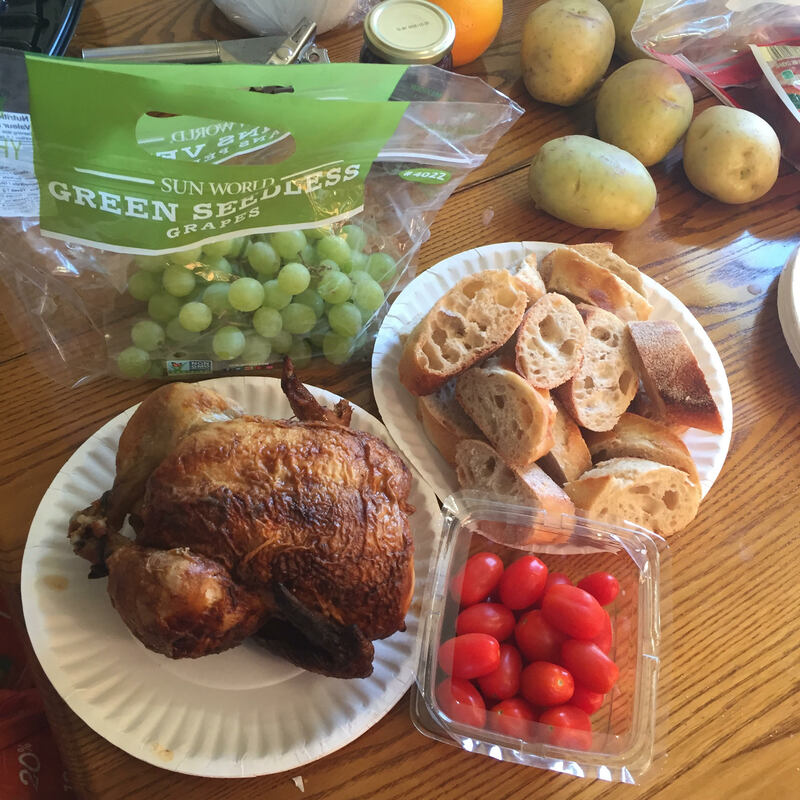 We bought a rotisserie chicken from the grocery store, and made sure to eat our cherry tomatoes without getting them everywhere (it’s not that hard, Denethor). 18. As Frodo and Sam try to remember the taste of strawberries on the side of an erupting Mount Doom, we somewhat insensitively reminded ourselves by feasting on strawberries with whipped cream. 19. We finish our feast back at the Shire, with more cake and tea. We decided to make some petit fours to switch it up, but feel free to just use the leftover cake from the beginning of your marathon. And thus ends the glorious undertaking that is a Lord of the Rings marathon feast! My advice? As tempting as it is to eat as much as the characters for all of these meals, pace yourself and instead have small portions. Don’t be a fool of a Took and eat four pieces of Lembas bread instead of one bite. Your stomach will thank you halfway through the marathon, when you’re starting to feel full but still have hours of eating ahead of you (much of which will be the aforementioned Lembas bread). If you’re wondering if a similar marathon could be done with the Hobbit movies, I assure you it is possible. That being said, it’s definitely going to be a long while until my friends and I attempt another marathon feast.